Robin here to remind you of our April Challenge. This is the card I made. For this I have used three different stamps. The first is Whimsical Clouds (G426). I stamped it onto plain white card stock. Then I used Rainy Day Harry (F605). I stamped him onto the clouds and onto a separate paper. I colored him with Copic markers and added Glastique to give him a real raincoat and boots look. He is then fussy cut without the rain and placed onto the cloud paper. I also added Glastique to the rain. Finally I used the sentiment Under the Weather E866. I stamped this onto some of the cloud paper. After the images were done I used a rose embossing folder and colored the flowers lightly. Then a single flower in the opposite two corners with a pearl in the center. I really like how this turned out. I hope you do too. 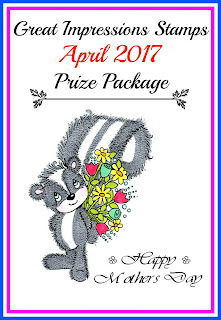 For this month the stamp you could win is a real cutie! 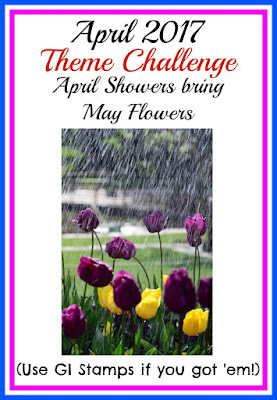 I do hope to see you in the challenge this month. Have a fabulous day!